The Current State of Merlot | Wine Splash! Alright, for all those who have been bad mouthing Merlot over the past few years, please stand up. Now all of you need to walk over to the far corner of the room and wait. Thank you. I need to tell you that your dislike of Merlot is unfounded and I am about to prove that Merlot is the number one outstanding citizen of the wine community. I mean, really, if Cabernet Sauvignon is the king of all wine varieties, Merlot is definitely the queen. With a long history as one of the main red grapes of Bordeaux, Merlot has established itself as a wine with which to be reckoned! Sure it has had many ups and downs. But haven’t we all? It’s hard to believe that a short clip in the movie “Sideways” would be the demise of a grape with such a noble background. Merlot is coming back, and this time around, we owe her our enduring respect. Actually, Merlot didn’t take the major beating that everyone thought it did after the “Sideways” movie was released in 2004. After researching many magazine tracts and critic/winemaker statements that predate the film, it was found that Merlot did slow down a bit in sales and stores that would normally buy 20 cases of Merlot a week were still buying 17 to 18 cases a week. To be honest, I still drank Merlot but avoided ordering it at restaurants. Mostly because I was afraid of the server exposing me by exclaiming “No [BLEEP] Merlot” throughout the restaurant! So I kept my Merlot cravings to myself and sipped other wines in public. So where did all this excess Merlot end up that everyone said they weren’t drinking? There was still Merlot that was being harvested, aging in barrels, and patiently waiting in warehouses to be shipped to consumers. Some winemakers didn’t want to produce a wine that was exclusively Merlot since they felt customers may reject it. So, many winemakers decided to reduce that risk and start to producing more Merlot based red blends instead, hiding Merlot under names like cuvee, reserve blend, and Meritage. Why do you think red blends have become so popular? Because there are more of them at fantastic prices. And the funny thing is that everyone really liked them! As much as we belittle soft, innocent Merlot, we accept it back in our hearts and palates and without fully knowing it. When you think about it, that little ribbing we took at Merlot actually helped out the wine industry in many ways. It exposed the lower end, flabby, and uninteresting Merlots that would have been better off being made into Sangria. It also put a spotlight on Pinot Noir and its delectable characteristics at the perfect time. In 2004, wineries on the west coast were releasing their 2002 vintage of Pinot Noir which was truly its banner year and it lofted Pinot Noir sales up 18 percent! Everyone knew a good Pinot Noir costed a few bucks more than most everyday Merlots and buyers got used to spending a bit more for a higher quality wine. So people were drinking better wines, both Pinot Noir and Merlot, and didn’t mind spending more for quality. A great situation in the wine world! 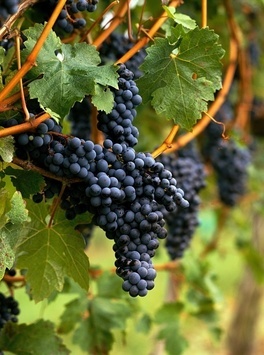 The University of Adelaide has compiled and published the very first complete database of the world’s wine grapes and regions. This database lists 500 regions, 44 countries, and 1,271 grape varieties. Based on their research, Merlot is the #1 planted grape variety in Bordeaux and also in many other countries of the world! Argentina, Chile, Italy, France, Australia, and the United States all show record numbers of Merlot plantings over the past few years. Demand and popularity for Merlot is continually growing and wineries are supporting this demand by planting more Merlot and preparing for the future. Merlot is interesting enough to be on its own but is also the perfect blending grape for any red wine that wants to add lush fruit, richness, and smoothness. Especially in Bordeaux where Merlot is Cabernet Sauvignons BFF! You will find these two comrades are together almost every time. With its voluptuous blackberry, cherry, and plum flavors, teasing nuances, and velvety finish, Merlot has a reason to be considered one of the best. Out of all the grape varieties in the world, Merlot would be the one known to have multiple personalities. It can be a wonderful entry level red for those who are new to wine or it can be intense and complex and would impress your favorite wine snobs. Merlot is so versatile and it pairs with so many wonderful foods like lamb, game dishes, many red meats, pasta with tomato based sauces, and medium cheeses. Airfield Estates Runway Merlot 2012 – Washington State. With an easy going style, this Merlot is perfect as an entry level red but everyone will love it! Flavors of ripe plum, blackberry, toasted oak, and a hint of spice. Medium to full bodied with soft tannins and a long, lingering finish. Pair with grilled chicken, ribeye, and tomato based pastas. $16 average. Michael Pozzan “Annabella” Merlot 2012 – Napa Valley, CA. This wine was aged in French oak for 18 months and the result is a rich, elegant Merlot with soft, supple tannins. Violet color in the glass with aromas of black cherry, dried cranberry, chocolate, and espresso. Silky mouthfeel with wonderful flavors of ripe cherries, black plum, coffee, and spicy vanilla on the finish. Fantastic! $18 average. Chateau La Fleur Morange Mathilde 2011 – Saint Emilion, Bordeaux, France. 100% Merlot coming from the region of France most renowned for Merlot wines. Medium to full bodied with aromas and flavors of blueberry, ripe plum, clove, and a subtle oak finish. Smooth and seductive. A plentiful 14.5% alcohol! $21 average. Mollydooker “The Scooter” 2014 – McLaren Vale, South Australia. A wonderful Merlot that will bring your taste buds to Heaven! But let’s start on Cloud 9. Soft and delicate with a pleasing balance of fruit, spice, and elegance. Flavors of bright raspberry, ripe red cherry, cocoa, with spice undertones. On the second sip, hints of vanilla, blueberry, and pepper led to a lush, smooth finish. All this and a whopping 15% alcohol! $26 average. Swanson Vineyards Oakville Merlot 2011 – Napa Valley, CA. This big, full bodied Merlot is what the Cabernet fan would love! Intense and complex but elegant through and through. Garnet in color with aromas of black cherries and dried cranberry fruit. Rich mouth-feel with a wonderful tannin structure. Generous flavors of sweet black cherry, ripe blackberry, coffee, and a hint of cinnamon. Nuances of nutmeg and cocoa on the sumptuous, velvety finish. Pair with steak, pasta with tomato meat sauces, and strong cheeses. $35 average. There is a plethora of wonderful Merlots out there and it is time to forgive and indulge! Plan your favorite meal, call a friend, and spoil yourself with a great Merlot soon. Everyone else is so don’t miss out! Oops! And all of you that are still standing in the far corner, you can go sit down now. Sorry. Rick Fillmore is a CSW, Sommelier, and writes wine and travel articles for Wine Connoisseur Magazine. Rick blogs using the name Wine Splash and his blog can be found at www.Winesplashing.Wordpress.com. Fifteen years in the wine business as a consultant, educator, writer, marketer, and promoting sales. Favorite red wine is Syrah and white would be a balanced, oaky Chardonnay. Cheers!